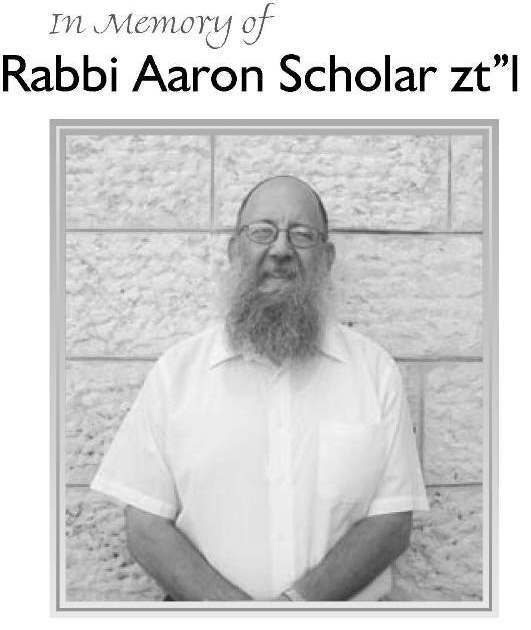 This site is dedicated by Mrs. Laya Scholar in the memory of her husband, Rabbi Aaron Scholar ZT"L.
Rabbi Scholar was a founding member of our Bais Medrash, an active member who literally built parts of it with his own hands. He was a loving and beloved member of the Bayswater community who was involved in all aspects of its spiritual growth, and who we all respected and admired. We respected and admired Aaron for his Hasmada, his Ehrlechkeit, his Emunah, and his dedication to the Klall, and to his family, which was always his first priority. Aaron came to every Shiur I gave, and never missed a Minyan. He was there when we needed him - and when did we not need him? He was loved by everyone for the love that he gave, and was respected by all for the tremendous respect he had for everyone around him. He exemplified all good Midos, and the Middah that he spoke most about was Emunah. Belief in Hashem and His Torah was, to Aaron, the most treasured prize anyone could attain. And attain it he did. And he passed it along, as well, to those who were fortunate enough to know him. So many people are better Jews because of Aaron, including myself. It is for that reason that this site, dedicated to bringing Emunah to those who seek it, is such an appropriate Zechus for his Neshama.